Every month you are paying for open empty air space in your storage areas. That open wall space and ceiling area could become very valuable to you overnight. 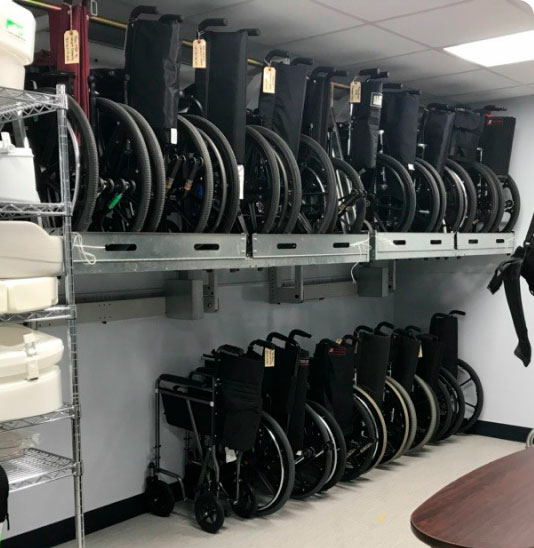 Storing wheelchairs, especially powered chairs, eats up floor space fast. Locating a chair and digging them out of a jam-packed room is difficult at best. Now you can store them overhead and have them at your fingertips in minutes. Your floor space stays open and you know where everything is. When does overhead wheelchair storage make sense? The LiftNStore® Overhead Lift is a simple and powerful machine. Each lift is eight feet long and holds six regular powered wheelchairs. The lift is bolted to your ceiling and is controlled with a simple up and down switch. When does wall mounted storage make sense? The TiftNStore® Wall Mount Lift is for folding wheelchairs. It bolts right to your existing walls and you don’t have to move your existing shelving. Each lift is six feet wide which makes them easy to fit into small storage areas. It is common to mount several lifts in-line to get the maximum capacity from your storage areas. These machines take about an hour to install. These lifts are easy for all employees to use.